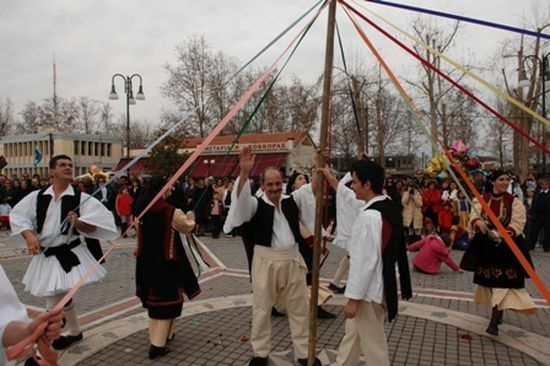 Gaitanaki is a traditional Greek dance that we dance during the carnival. It is a colourful and funny dance! We need 13 people for this dance! One person is holding a wooden pole with 12 ribbons hanging from its top. The ribbons have different colours and every person is holding a ribbon. When the music begins, the dancers move towards the pole, go under the other dancer’s ribbon, move far from the pole and then towards the pole again! A colourful braid is created on the pole when the dance finishes. This dance is a symbol of the circle of life. We move from happiness to sadness, from winter to spring, from life to death and the opposite!